The United States Navy rules the world’s oceans with its 10 Nimitz class carriers. Each of these carries around 70 jets which is actually more than many air forces around the world. The carriers are ready to intervene in any theater around the world in a very short notice. They were supplemented by USS Enterprise CVN-65 till her retirement in 2012 after serving for nearly 50 years. The Enterprise entered service in 1962, the first of the Nimitz class entered service in May 1975 whereas the last of the 10 Nimitzs was commissioned in 2009. Even though they were built nearly 30 years apart, they retained a lot of 1970’s design features and thus adding new technology was a difficult task. Hence in the early 2000s the USN felt the need for a new carrier which could replace the conventional carriers along with the Nimitz and Enterprise in the long term. In this article we will talk about the Ford class, the class of carriers destined to rule the oceans. No navy in the world operates 3 dedicated aircraft carriers, let alone 3 nuclear powered ones. Here is a pic of CVN-70, CVN-76 and CV-74 at the pier. USN was not ready to fund a carrier with lots of new but unproven technology after the Seawolf debacle. They chose a moderate path that would undertake the evolution of the new carrier in steps starting from the CVN-76. USS Ronald Reagan would receive some of the new technologies to reduce integration costs. The CVN-77 however would utilize new technology at much larger level. It would have improved propellers, a bulbous bow and new combat management systems. The CVN-77 would be followed by 2 carriers, designated CVNX-1 and CVNX-2. The former would be based on the hull of the Nimitz class, but would feature extensive redesign in all sectors. It would have the increments in the following sectors over the former Nimitz class. The CVNX-2 would feature a newly designed hull along with new technology like new reactors designed using technology from submarine reactors. It would have new aircraft launch and recovery system, redesigned flight deck, redesigned aircraft handling systems and island. One of the suggestions was to remove the elevator no.1 on the starboard side as it is rarely used due to its closeness to bow catapults. The other elevators would be redesigned to handle 3 aircraft at a time. By late 2002 it was clear that the plan to have 2 carriers in the evolutionary phase wasn’t going to work due to the costs associated with the construction and integration of new technology in these carriers. Both the Pentagon and the USN wanted to kill the CVNX-1 and start the construction of CVNX-2 directly. Pentagon wanted to start its construction in 2009 whereas the Navy wanted it to be laid down in 2007 and follow the time frame of the cancelled CVNX-1. By 2003, the final decision was taken, the CVNX programme was restructured and renamed as CVN-21. Thus the carrier was supposed to be designed ground up for service in the 21st century. Instead of a new design which was supposed to be designated CVNX-2 prior to the restructuring, a design based on Nimitz’s hull would be developed. It would have all of the new technology being developed for the future carriers instead of step wise integration akin to what they would do with the Virginia class SSNs. The new carrier was supposed to have a heavily redesigned island and flight deck along with new aircraft launch and recovery systems. The carrier would be powered by new reactors which would utilize technology from newer submarine reactors. In 2006 it was decided that the lead vessel would be christened as the USS Gerald R. Ford CVN-78 thus becoming the 12th American nuclear powered carrier, 13th nuclear powered carrier around the world and 14th nuclear powered carrier ever to be laid down (counting the unfinished Soviet carrier Ulyanovsk). As per the laid down force requirements, the USN should always have a minimum of 11 aircraft carriers in service with some of them deployed and the rest in RCOH or refits. With the inactivation of USS Enterprise in 2012, the USN is left with 10 Nimitz class carriers and thus a waiver period between the inactivation of the Enterprise and commissioning of the Ford was provided wherein USN could operate 10 aircraft carriers. The USS Ford would be laid down in 2009 following the Pentagon time line for the now cancelled CVNX-2 due to the delays associated with the CVN-77. It would be launched in 2013 and commissioned in 2016. The second carrier of the class was christened as the USS John F. Kennedy CVN-79 whereas the 3rd has been named as the USS Enterprise CVN-80 in public interest to keep the legacy of the legendary USS Enterprise CV-6 going. The vessel is 335m long, 41m wide at the water line, with the flight almost twice as wide at 78m. The vessel displaces 100,000 tonnes of water when afloat and has been made out of 1100 or so modules which have been assembled at the drydock like an extra large puzzle. It sports 3 deck edge elevators instead of 4 on its predecessor Nimitz. Two A1B reactors power this vessel, each producing nearly 1.5 times the power produced by both the reactors on the Nimitz. The two reactors propel 4 shafts which turn 4 propellers placed below the stern of the vessel. She can carry a maximum of 90 aircraft, the number can however be boosted during war time. Normal air wing will be around 70 aircraft. The air wing would include F/A-18C/D Hornet, F/A-18E/F Super Hornet, E/A-18G Growler, F-35C (in the future), UAVs, E-2C/D Hawkeyes whereas the rotary winged complement includes MH-60 family aircraft used for sub hunting, surface strike and SAR. She will have a crew of around 4000 men and women, nearly 500 less than the Nimitz due to the increased automation. They would service the carrier, its aircraft and serve other men & women working on the carrier. The carrier would feature extensive redesign in almost all areas. The flight deck, which is the business end of the carrier has received a lot of rework. The island has been shifted further back to improve flight operations, on deck maintenance, arming and fueling operations. The no. 3 aircraft elevator on the starboard side has been deleted and thus only 3 elevators are present on the carrier. Aircraft handling process has been changed to reduce man power required for the job and to increase efficiency of the process. The number 4 catapult has been repositioned to launch fully loaded aircraft which was not possible on the Nimitz class. The biggest change comes in the form of Electro-Magnetic Aircraft Launch System a.k.a. EMALS which replaces legacy steam catapults. This also removes all of the necessary tubing for the steam which is routed from the reactors thus freeing up more space on the inside. New Advanced Arresting Gear replaces the older Mk 7 arresting system for better aircraft recovery. Ford will be powered by A1B nuclear reactor which is specifically designed to supply increased power demand for a wide range of onboard systems with plenty of juice left for propulsion and future additions. The island has been redesigned as well and has been made smaller. It sports AN/SPY-3 Dual Band Radar a.k.a. DBR which works in two modes. It works in X-Band for low altitude scanning and tracking of targets using precise beams. It also provides guidance to the ESSM which is the onboard air defense system. It also has AN/SPY-4 S-Band radar which performs volume search. Unfortunately USS Ford will be the only vessel of the class to have DBR whereas the other vessels would have single band radars of a different type for cost saving. The DBR system was originally developed for the Zumwalt class of DDGs but has been deployed on the Ford to maintain commonality between platforms. Two large maintenance areas were provided on both sides of the fan tail to improve the servicing facilities available on the carrier. To sum it up, here is a list of changes the Ford has. A1B 300MW reactors instead of A4W 100MW reactor on Nimitz. Improved deck layout for efficient deck ops. Increased sortie rates from 140 to 160 or a day with a maximum of 270 during combat. EMALS instead of steam catapult. 3 aircraft elevators instead of 4 on Nimitz. Redesigned island which has been moved back. Dual Band Radar for increased situational awareness. Increased automation and hence it requires 500 or so less crew. ESSM with active homing for self defense. Modular cabin design which allows easy re-purposing of available space. Note the island has been moved further aft and the No. 3 elevator on the starboard side is missing. The EMALS need a paragraph of its own thanks to the capabilities they offer. The steam catapults couldn’t launch light drones as they had a minimum load rating. This has hampered integration of drones USN carriers for a long time. The EMALS have the flexibility to launch a wide variety of aircraft and hence light aircraft might soon make their way on to the decks. They are easy to maintain compared to the steam catapults which need extensive maintenance to the steam supply system and the launch system itself. The system doesn’t require elaborate recharge times like the steam catapults. The latter were not as reliable either. Thus EMALS played an important role in improving the sortie rate. A prototype was installed at the USN base in Lakehurst and was used to launch all of the USN aircraft including the X-47B UCAV demonstrator and F-35C which will enter service soon. Several countries are interested in buying this technology. India has already signed a deal with the Americans for joint development of the EMALS for their future carriers, whereas the Chinese are speculated to be developing their own system for their future carriers. F-35C ready for launch using the land based EMALS prototype. First piece of steel was cut for this carrier was cut on 11th of August 2005 whereas the keel was laid down 4 years later on 13th of Nov 2009. The carrier was christened and launched on 9th of November 2013 after 4 years of construction. 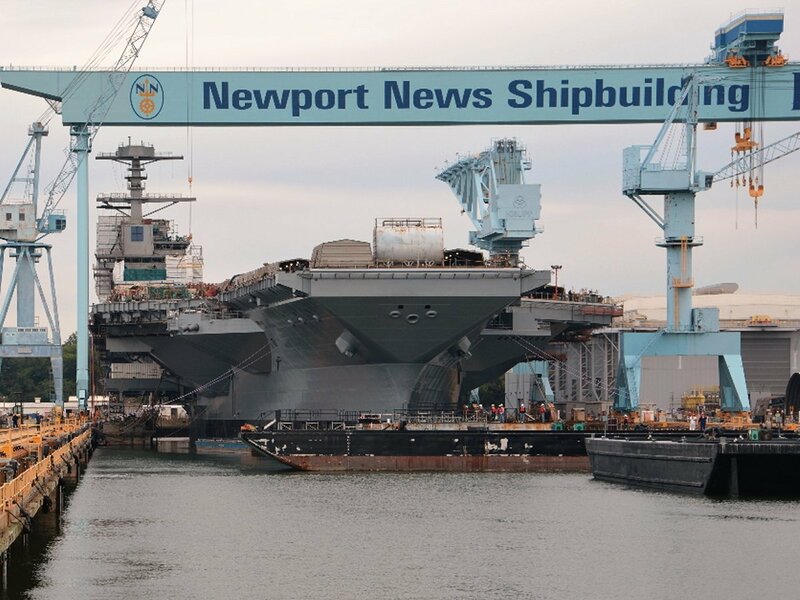 She is presently being outfitted at the Newport News shipbuilding yard and will be handed over to the USN in early 2016 for sea trials and will be commissioned thereafter. As mentioned earlier she will be the only Ford to have DBR whereas the other vessels would have a different radar. The vessel’s EMALS have been successfully tested using . Here is a video from the trials. USS Ford seen just after her launch. Post commissioning on 22nd July 2017, maiden air ops were conducted by the VX-9 off the carrier’s deck. You can see the video above. Considering the large amount of new tech in use onboard this carrier, she will not be deployed anytime soon. Tentative date of 2022 has been set for her maiden deployment. Looks like the commissioning ceremony was more of a place holder instead of the usual indication of a totally operational vessel. The USS Enterprise CVN-65 was commissioned in late 1961 and was deployed around August the next year whereas the USS Nimitz was commissioned in 1975 and deployed a year later in 1976. Four years of trials before deployment seems too long for a carriers of a country which has built 13 of the world’s 12 nuclear powered carriers. USN is all set to buy atleast 10 or so Ford class carriers to replace the ageing Nimitz class carriers. USS John F. Kennedy will replace the USS Nimitz and the new Enterprise would replace the Dwight D. Eisenhower. JFK has been laid down on 22nd of August at Newport News shipyard. She is slated to be delivered to the USN in the mid 2020s. Work on the Enterprise would begin soon as well and is probably underway. She is slated to enter service in the late 2020s or at the start of the next decade. USN might delay the procurement of these carriers and push their dates a year further to reduce procurement costs and allow the technologies to mature. USS JFK will be the first of the class to undergo shock tests as they won’t be conducted on the Ford.. The delays won’t stop Ford and her sisters from taking over the reign of the world’s oceans from the Nimitz class. Keel laying ceremony of CVN-79. The addition of this foredeck module marked 75% completion of the future USS JFK.